The parking situation is exactly the same as it was for the Holei Sea Arch, so no need to move your car! There are outhouses located here, but as far as I know there isn't running water. I do believe a concession stand operates here but I'm not sure of the hours. 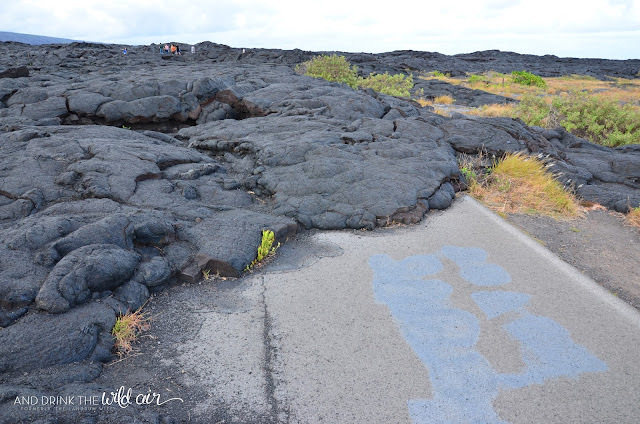 Since this walk consists of following an already-paved road, I would consider it stroller and wheelchair-friendly. However, once you make it to the lava flows, it definitely is not, so take that into consideration. I would expect to spend around a half hour to 45 minutes walking to the flows, exploring them, and then heading back to your car. 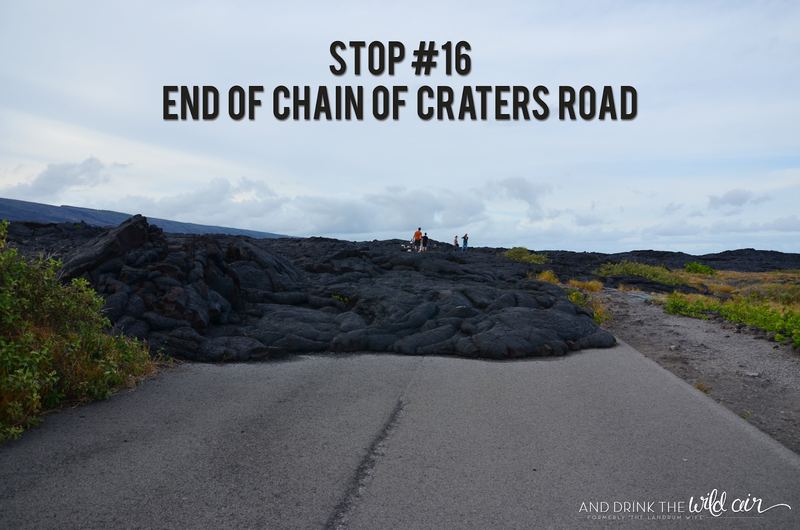 AT THE TIME OF THIS PUBLICATION, the end of Chain of Craters Road is CLOSED due to construction to attempt to create another way out for residents in the Pahoa area who are being threatened by active lava flows. Neither NPS nor I know when it will be reopened, but I have written this blog post as if it were open to the public since I assume it eventually will be again, although the landscape may not be the same as I've photographed below. Whenever I get word of the re-opening of this area, I will gladly update this blog post. 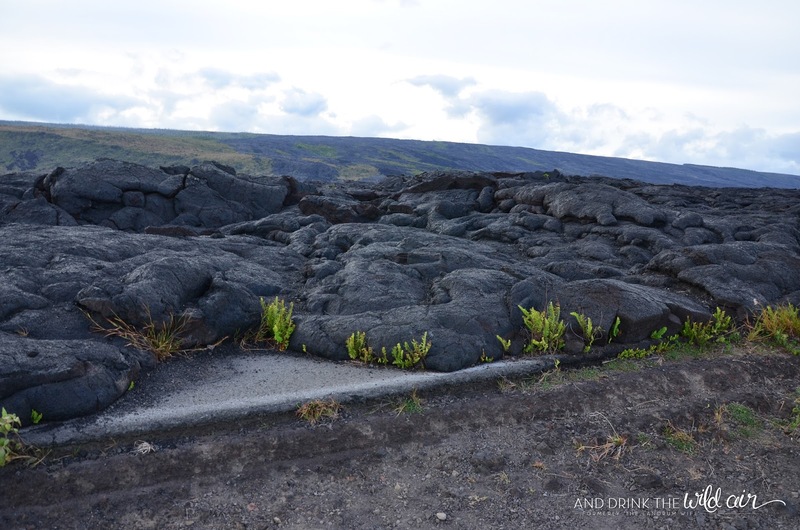 UNTIL THEN, this particular lava flow area is not accessible (unless signage posted dictates otherwise), so please don't try to check it out anyway! 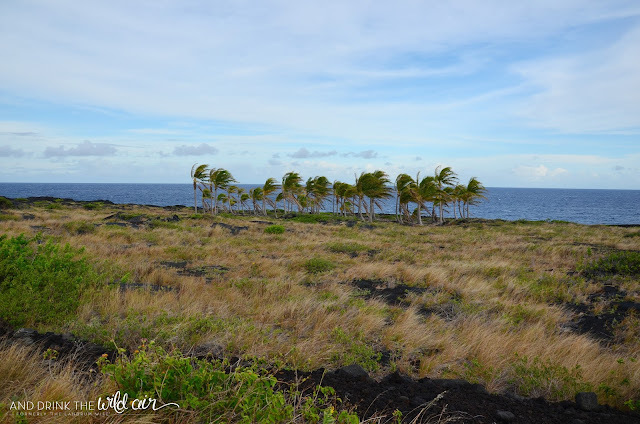 Random grove of palm trees out in the middle of nowhere -- didn't expect to see that, but it was beautiful! The flows that came through here and wiped out Chain of Craters Road are much younger than the Mauna Ulu flows we passed through and explored earlier. These flows all came from Pu'u O'o, the vent of Kilauea that is currently still erupting. The particular flow in these pictures came through this area from 1992 to 2007. One flow from 1986-1992 was responsible for the destruction of one of the towns in this area, Kalapana, although that flow came from Kupaianaha, a different vent. 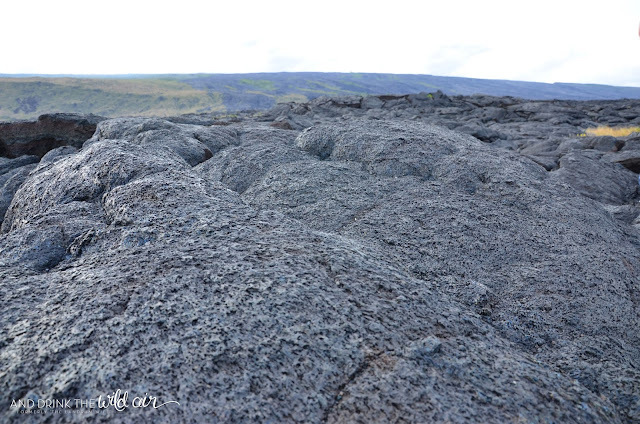 Pu'u O'o is most definitely still active. 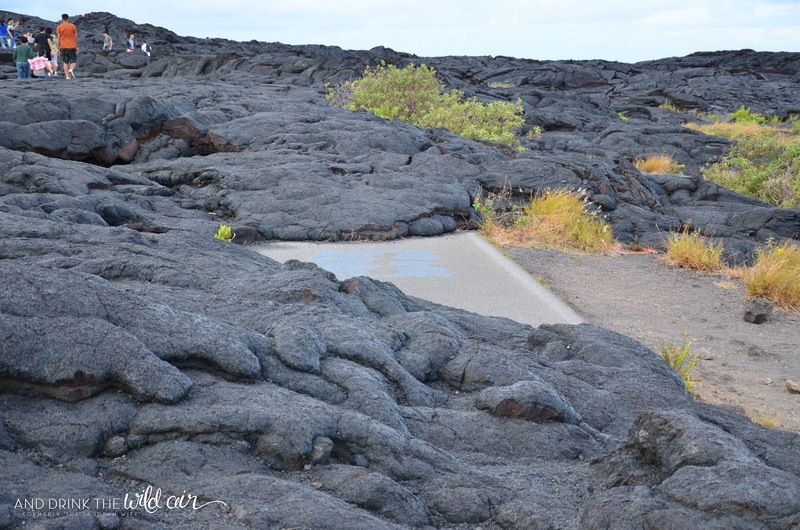 Its lava flows are no longer heading downhill, though. They're moving east instead. 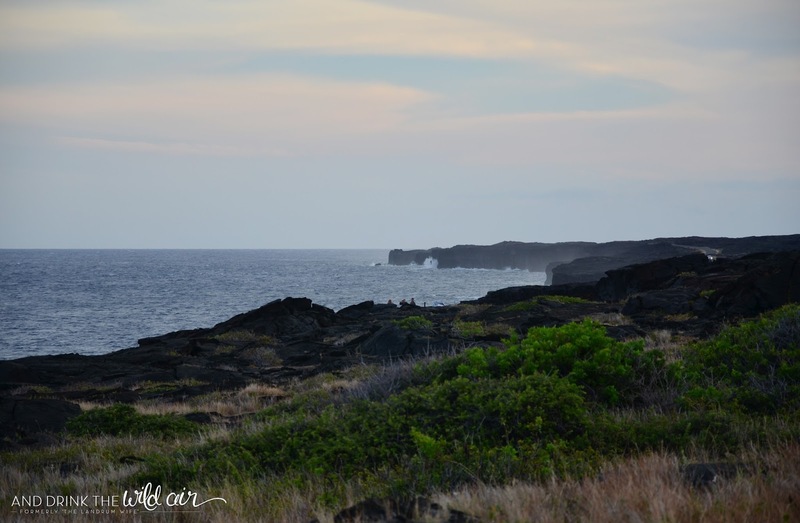 Last year, one particular breakout had Pahoa, another Hawaiian town, straight in its path. 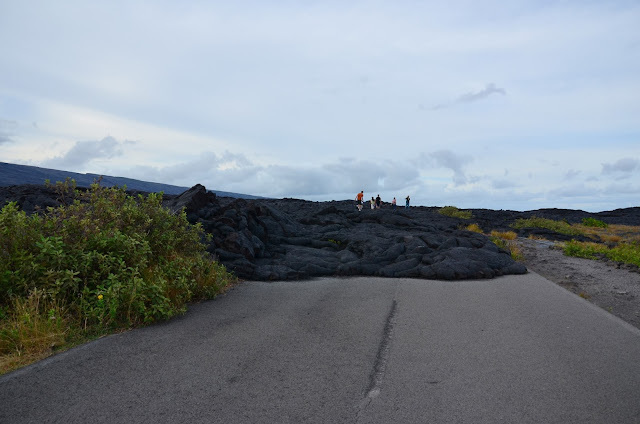 The ever-looming threat of the Pahoa and Puna area is the reason why officials are recreating the section of Chain of Craters Road that has been destroyed by lava. It won't be an official public road, but instead will serve as an emergency escape route for residents of that part of the Big Island in case the lava plows through. 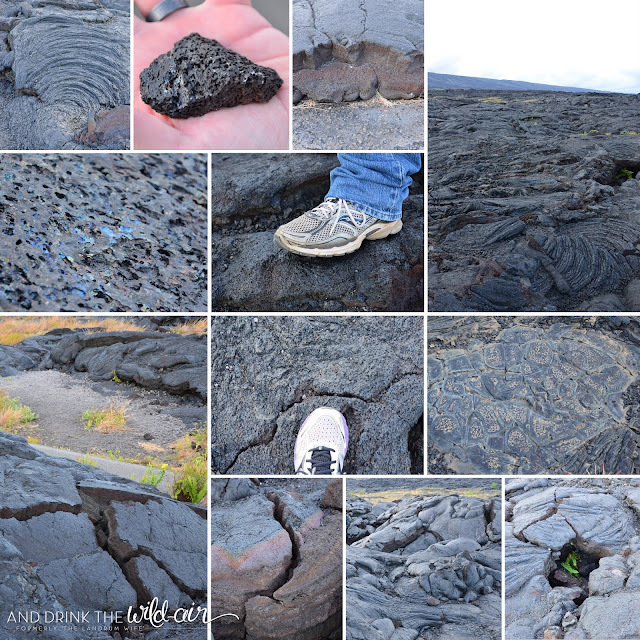 If you're interested in seeing a map of all these lava flows, Hawaii Revealed has an excellent illustration here. 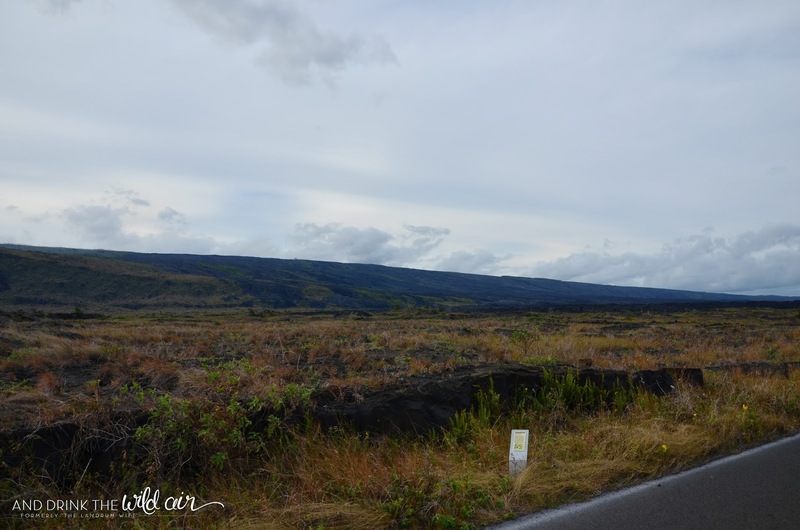 This swath of land from here east to Kalapana is the area where you've undoubtedly seen pictures or videos of flowing lava meeting the ocean in a violent, beautiful display. 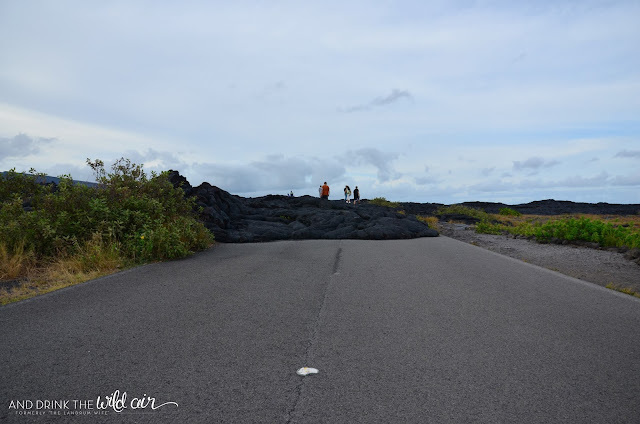 Unfortunately during this trip and our second to the Big Island, the lava had stopped flowing into the ocean and it still hasn't started again. I'm sure it'll happen again one day though, and if it does, you can bet I'll be doing my best to get there and check it out in person! 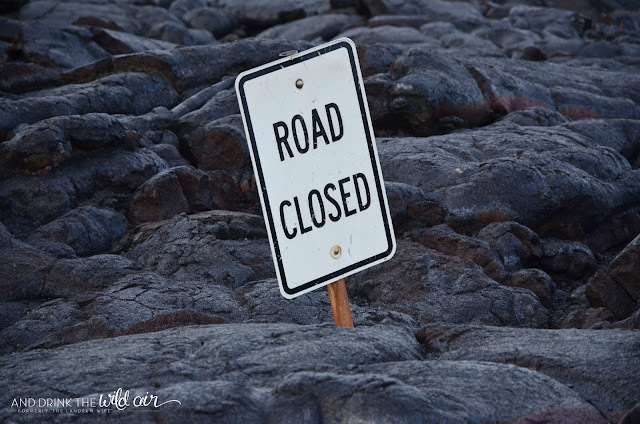 Famous "Road Closed" sign -- unfortunately it was removed in order to make way for the new Chain of Craters Road. 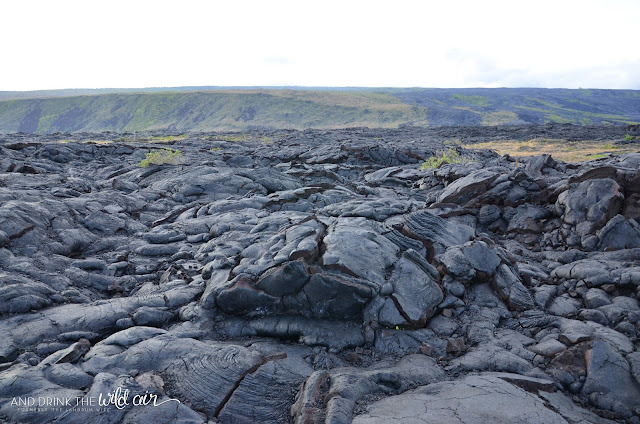 Mr. L and I had a blast climbing over the hardened lava and just exploring the various shapes, patterns, and colors lava turns into. It's fascinating how different each area of the flow can be! I had to make a collage for all of you to showcase what we saw since there was no way I could fit each single picture all into this post. I'm still amazed at how beautiful it was to witness in person! 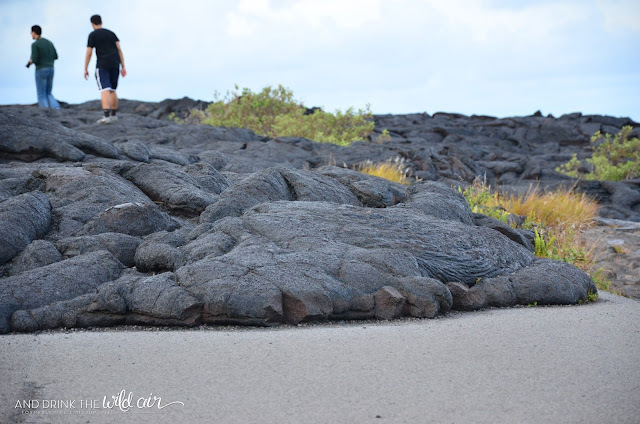 Yep, we walked on it! Photo proof, haha. 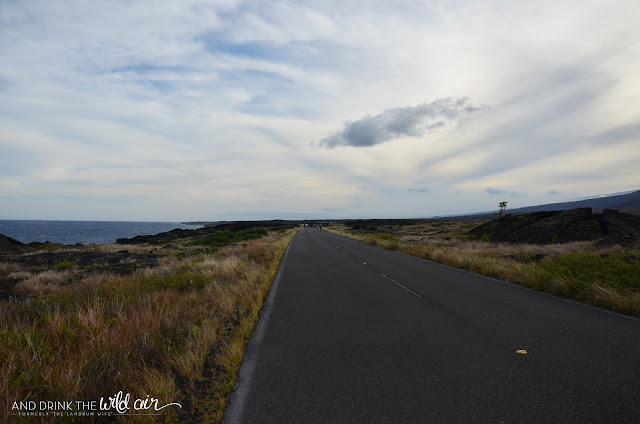 End of Chain of Craters Road from And Drink the Wild Air on Vimeo. I was so thrilled that Mr. L and I both go to cross something off of our personal bucket lists with this spot. 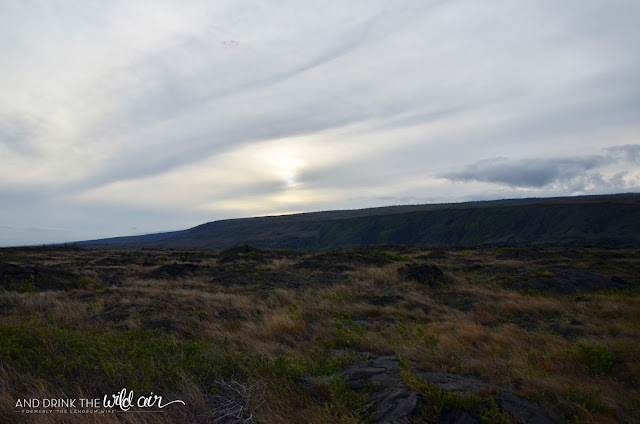 I also loved that this was the end cap to such an awesome tour of Hawaii Volcanoes National Park! Although we only got to visit the park once, it'll always hold a special place in my heart as one of the most unique and beautiful places I've been to in the world. I also think it is absolutely one of those places that you need to eventually revisit as well in order to savor it with a different eye, and I am so looking forward to going back one day and being able to experience all of it all over again! STOP 16: End of Chain of Craters Road <--- You are here!